The Maruti Suzuki Ertiga 7-seater MPV has become an instant hit among buyers with sales numbers surpassing even the company’s expectations. CarToq has found out that the top of the line ZDI and ZXI variants have the most demand and hence also have the longest waiting periods. 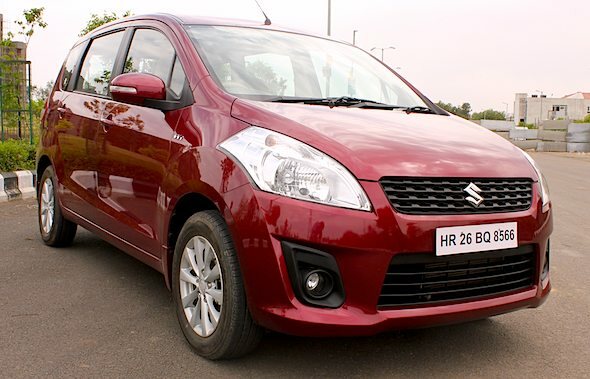 Within a month since its launch, the Ertiga clocked more than 32,000 bookings. Due to the overwhelming response, the Ertiga is plagued by a long waiting period in most cities across India. CarToq spoke with dealers across five major cities to find out what the waiting period of each Ertiga variant presently is across cities. The waiting period for the top-end variants is almost twice that of low-end variants. For instance, the Ertiga diesel top-end variant (ZDI) has a waiting period of nine months whereas the VDI and LDI have a waiting period of 2 – 4 months. Similarly, the waiting periods for the fully loaded top-end petrol variant (ZXI) is twice that of the low-end variants, namely; VXI and LXI. This clearly shows that the current buyer trend is to opt for top-end variants that have more features than the lower variants. The following table shows the waiting period of Ertiga models in five major cities. Top end variants: The ZXI/ZDI variants of Ertiga features ABS, dual airbags, steering mounted audio controls, tweeters, alloy wheels, rear window defogger, wiper and washer. Mid trim variants: The VXI/VDI variants do not have the aforementioned features but still come with a security alarm system, second row AC, music system with USB input, four speakers, power windows, central locking, and keyless entry, ORVMs with side turn indicators, fog lamps and optional ABS. Base variants: The base variants LXI/LDI have features such as power steering with tilt adjust, AC with heater and ABS with Brake Assist & EBD (for LDI variant only). The Ertiga petrol is powered by a 1.4-litre K-series motor that puts out 94 Bhp of power while the Ertiga diesel is powered by a 1.3-litre DDiS motor (same as in SX4 diesel) that puts out 89 Bhp of power. The ARAI-certified fuel efficiency of the Ertiga is 16.02 kmpl for petrol and 20.77 kmpl for diesel. The Ertiga is a value for money car thanks to the spacious cabin that can accommodate seven people, contemporary features and its aggressive pricing (Rs. 5.89 lakh – Rs. 8.45 lakh) which makes it substantially cheaper than its rivals such as the Toyota Innova (Rs. 9.14 lakh – Rs. 13.58 lakh) and Mahindra Xylo (Rs. 7.47 lakh – Rs. 10.47 lakh). « Tata Manza test mule spotted with new dual tone paint job!